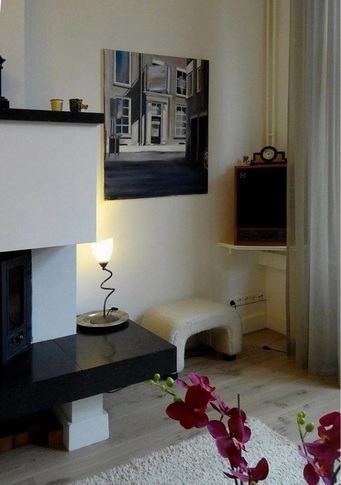 It is possible to visit the studio in Haarlem to view paintings by Vera West. Paintings in real life naturally give the best impression. Click here for contact details. You can request a viewing via the order form. We offer you the opportunity for a one-month trial where you can choose and hang up a painting by Vera West. After this month you decide whether you would like to purchase the painting. This is a perfect way of getting the best impression by having the painting in your home. * After this trial period you cannot claim your right of withdrawal again. You can request a trial month via the order form. You can order by filling in the form below. Here you can specify whether you want to request a viewing or a trial month and you can choose the method of delivery. After actual purchase, you will receive an invoice with VAT. Zie 'work' of de prijslijst voor de titel van het werk. In beide gevallen nemen wij contact met u op voor een geschikte datum.